Dan Zemelman & Tiffany Austin bring a high level of artistry in jazz and improvisatory music that draws from many different genres. From originals to standards, you will be moved by the lyrics, the spirit, and the creativity of these phenomenal artists. 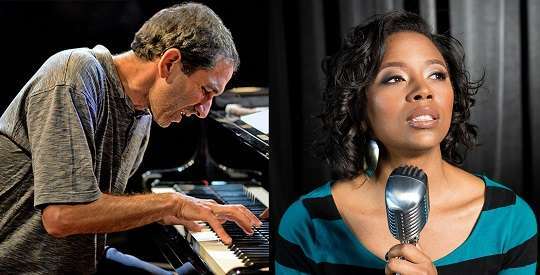 Both of them have expansive careers and have presented at many of the Bay Area’s top venues including SF Jazz, Yoshi’s, Freight & Salvage, and around the world. They’ll will be joined tonight by bassist Owen Clapp. Tiffany Austin is one of jazz’s elite singers and a formidable songwriter as well. Rather than separating African-American music into individual tributaries, Austin plunges into the whole river of sound that’s sustained black life in America. Her music is full of a soul-steeped affirmation that embraces blues and swing, spirituals and R&B, bebop, post-bop, and her own Louisiana Creole heritage. Dan Zemelman is a pianist, leader and innovator of jazz music. In 1998 Dan participated in the Kennedy Center’s prestigious Jazz Ambassadors program and toured India and Sri Lanka representing America’s jazz tradition through teaching and performances. In recent times Dan has performed/recorded with alto sax jazz legend Lee Konitz on an album and Europe tour. Dan has played Fifth Street with violinist Mads Tolling.